The Jungle Book, released in 1967, was the last Disney animated film made during Walt Disney’s lifetime. I have to say that the main draw of this movie for me might be the songs. I remember having a cassette of Disney songs as a kid, and “The Bear Necessities” and “I Wanna Be Like You” were my favorites on it. The movie as a whole is pretty good, though, if a bit slow in parts. The animation isn’t as nice as in the earlier Disney animated movies, but it still has quite competent character animation and appropriate jungle backgrounds. I haven’t read the Rudyard Kipling stories on which the movie is based, but from what I’ve heard about them, the character of Baloo was changed considerably. Kipling made him the serious teacher of the Law of the Jungle, while Disney basically made him a hippie. I guess that reflects the time in which the movie was made, although his slang came across as more from the fifties than the sixties to me. 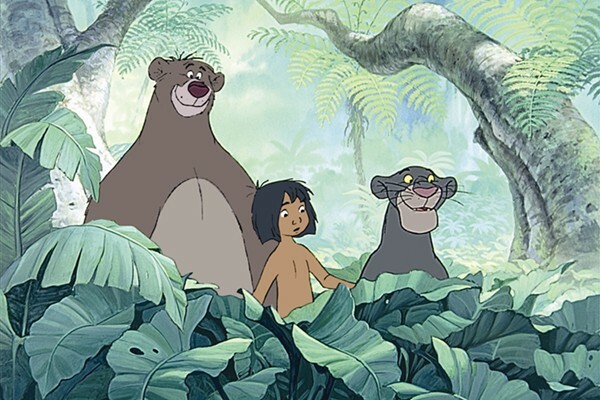 For the most part, the movie was episodic, with Mowgli getting into one troublesome situation after another and Bagheera and/or Baloo having to rescue him. Kaa the Snake shows up twice, with some of the animation obviously being the same both times. His appearances utilize the myth that snakes can hypnotize their prey, which isn’t true but might be based on how some animals will freeze in fear upon seeing a snake. The idea of the hypnotic snake also featured in Robin Hood and Aladdin. The elephants were played for comic relief, with a scene of Colonel Hathi inspecting his troops coming off as amusing but a bit drawn out. 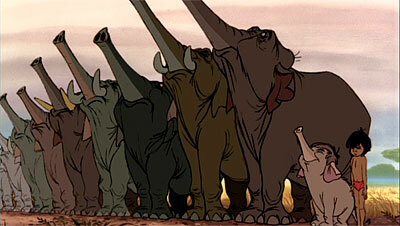 Hathi’s wife was voiced by Verna Felton, making it the second time she played an elephant in a Disney movie. Their son, oddly enough, had the voice of Clint Howard. A personal favorite of mine is King Louie, the orangutan played by jazz musician Louis Prima. Louie didn’t appear in the Kipling stories at all, and orangutans aren’t native to India anyway. I’ve seen it suggested that they used an orangutan because they have opposable thumbs, and so presumably could make fire if they knew how. The fact that they could animate him in all sorts of acrobatic positions also didn’t hurt, I’m sure. His reference to fire as “man’s red flower” is actually from Kipling’s original. I understand it was considered having the Beatles voice the vultures, although in the end they didn’t. Finally, we come to Shere Khan, the main villain of the piece. The tiger talks with a posh British accent, which was true of later Disney villains as well. I believe the little bit of a song he performs was sung by Thurl Ravenscroft, the long-time voice of Tony the Tiger. That guy just couldn’t get away from tigers, could he? While the movie did eventually get a direct-to-video sequel, there was also a live-action remake of sorts that came out in 1994. I saw it at the theater, but I don’t remember it all that well, and it doesn’t seem to get discussed all that much. I do remember that the animals didn’t talk, which was apparently also true of the live-action 101 Dalmatians. This entry was posted in Revisiting Disney, VoVat Goes to the Movies and tagged bagheera, baloo, clint howard, colonel hathi, elelphants, kaa, king louie, louis prima, mowgli, orangutans, rudyard kipling, shere khan, snakes, the jungle book, thurl ravenscroft, verna felton. Bookmark the permalink. Nate, do you remember seeing “The Jungle Book” at the drive in theater that used to be south of West Chester? Yes, that was the first time I saw it. I forget exactly how old I was at the time.